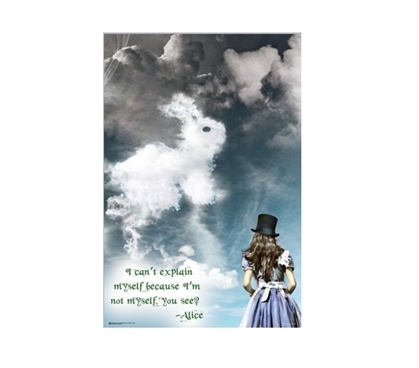 This is an amazing dorm wall art item for fans of Alice In Wonderland! This must have dorm item is a beautiful addition to dorm room decor, but it also showcases a literary classic. Our Alice's Illusions Dorm Room Poster features Alice in her signature blue dress with a top hat in the corner of the college poster looking up at the sky. Of course, this is Alice in Wonderland, so that is no ordinary sky! The sky a mix between storm clouds and gorgeous blue sky and highlighted in the storm clouds is - of course - the rabbit. Along the bottom of this dorm essentials item is a quote, which makes this college supplies item even better! Plan on having a lot of books on your dorm desk bookshelf? This cool poster for dorm rooms would make a perfect addition to your dorm desk bookshelf! Place this dorm necessities item over your dorm desk bookshelf and you will have a really cool looking literary corner for yourself! Your dorm room decor is about expressing yourself and your interests. If Alice in Wonderland has always been a movie and book you loved, this is the perfect addition to gorgeous dorm room decor that displays your personality.